Fourth of July is a great time to celebrate our Declaration of Independence. One of my children this past school year had a project on John Hancock which gave me a little better insight into this great holiday. Many of us either entertain or go to parties, swim, play yard games, watch fireworks, and barbecue. We here at CoolStuffForDads.com are currently adding some excellent picnic and BBQ products which are sure to useful for these events. 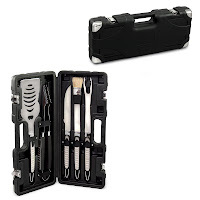 For example, you might check out the Inferno stainless steel BBQ tools, which offers five stainless steel BBQ tools in an attractive storage case (see for yourself in the above image). Whatever you decide to do this 4th of July, be safe and have fun! !